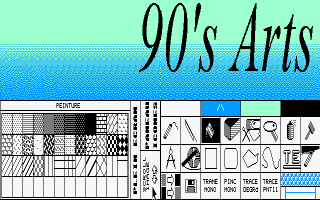 90's Arts is a pixel painter prototype. It works in St medium resolution (640x240x4). 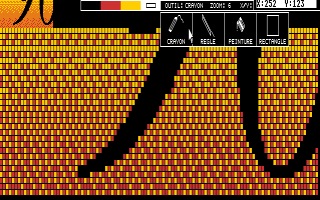 This program had never been released as it was replaced by Synthetic Arts 2.x and 3.x projects : at one point, it has appeared more relevant to develop an ST low resolution tool (320x200x16) instead. 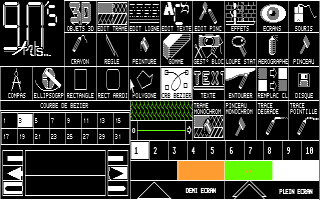 The decision to cancel 90's Arts and develop an ST low res tool had been taken at the "Forum Atari 90" in Paris (CNIT - La Defense) while we were animating the Contact'St association stand. 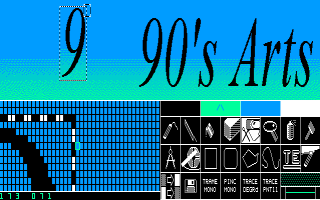 Nevertheless, most of the innovative interface concepts included in Synthetic Arts 2.x / 3, were designed for 90's Arts.